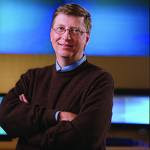 Telemachus: Who Has Created More Jobs: Bill Gates or the Federal Government? Frank, interesting and in concept right on. Having been in and around Microsoft for a long time, you probably overstate their jobs contribution. But fair point. However, you seem to suggest that if we abolish that corporate income tax we'd unleash more Bill Gates's. In a word - balderdash. So the corporate tax code was in existence when Gates and Allen founded what is now Microsoft. And having worked with MS just after they moved from New Mexico to the Seattle area, I can tell you that those two geeks were not thinking about the tax code. That came much later. They were totally motivated by creating geeky technology not paying less taxes. And if it hadn't been for IBM buying what became MS-DOS after Gates surreptitously acquired Seatte-DOS, and a father who totally understood IP and contract law (and plenty of money), we would not have all those jobs that Microsoft created. In other words, entrpreneurs do not create and build companies because of anything to do with the tax code. They only worry about that much later when they start making real money and are burnt out on being entrepreneurs. Abolishing the corporate tax code would only benefit the owners of existing companies. Not necessarily a bad thing, but I have real problem with companies (shareholders and executives)getting a free ride in the greatest economy in the world. Someone has to pay for the roads that transport those goods, ensuring a sound financial system, educating the workers that they employ, etc. In other words they benefit mightily, so they need to pay their share. Now, if you really want to spark creation of new companies and help small companies grow - then solve the health care problem, facilitate a financing market that mitigates some of the risk, etc. The next Bill Gates (who likely will not come from a wealthy family) is too scared to quit his job because he or she would lose their health insurance, and can't (or doesn't know how) find the working capital to grow. Gates didn't have to worry about that too much. And my last point - I would argue that companies don't create jobs either - but buyers of goods and services do. If a company or the government has a good or service that people need/want and they buy it, jobs are created. If not, then not. Nuf said.... keep up the good blogging. But IF they could look down the road in their crystal ball and not see these higher taxes looming AND an elimination of corporate taxes to pay (which means no tax accountants or lawyers to pay or lobbyists to hire in DC to defend their special exemptions), those NPVs would sky-rocket and the would start allocating capital again. AND, abolishing the corporate income tax would wind up being way less costly than the accumulated total of all these FDR-style infrastructure projects we are spending money on like drunken sailors...which is an insult to drunken sailors. But you are right on health care...that is the Gordian Knot of this whole equation. I just don't think this current iteration of 'reform' is going to work..I hope it does, but I am betting it don't. run for Congress...you and your brother...what a team that would make up there!